Comes in a dark wood frame with linen liner and brass nameplate. "Oswald Chambers once said, 'One of the reasons for our sense of futility in prayer is that we have lost our power to visualize. We can no longer even imagine putting ourselves deliberately before God'. 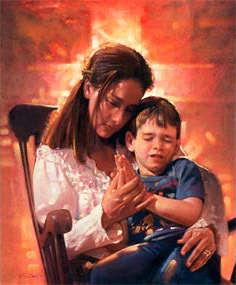 "Lord, Teach Us to Pray shows a mother teaching her son about that special and personal connection to God. Look closely at this painting and see the cross formed by the intersection of light behind the mother and child. Like little children, we often revert to one-way communication with God — we talk and He listens. Prayer is so much more than that. It is a moment in time for us to enter the very throne room of God and spend time conversing with the Almighty." Lord, Teach Us to Pray copyright© by Ron DiCianni.